An alleged dog-fighting operation in Tilbury East Township will lead to dozens of additional charges against three individuals, investigators said Wednesday in Chatham, Ont. Chatham-Kent police and the Ontario SPCA held a news conference Wednesday afternoon, updating the public on the investigation. They said the animals at the centre of the investigation were "pitbull-type dogs." Warrants were executed at a property on Morris Line in Tilbury East Township last week and three people were arrested. Each of the accused already faces animal cruelty and firearm-related offences. Police said they would not reveal the full inventory of pending charges – 92 more each – until they had been formally laid in a Chatham court on Thursday. Police initially reported seizing "approximately 40" dogs from the property, but they amended that figure on Wednesday to 31 dogs, along with one additional dog found dead. Tests will be undertaken to determine the cause of that dog's death. Each of the seized dogs were scanned for a microchip and Insp. Brad Dewar of the Ontario SPCA said none of the recovered dogs were stolen or missing pets. In addition to the animals, police also seized hundreds of items used to train dogs for fighting. While Dewar wouldn't speak to specific items in this case, he did speak to equipment, drugs and detailed records generally used in these types of operations. "When it comes to animals that are used in training for fighting, typically, detailed logs are kept," Dewar said. "Exactly what [the dogs] eat, if they're being used on a treadmill — the length of time they're being used, if they're being used to haul heavy weighted belts or harnesses, those types of things are going to be tracked and logged." Dewar also said the dogs found at the property had suffered injuries from fighting. 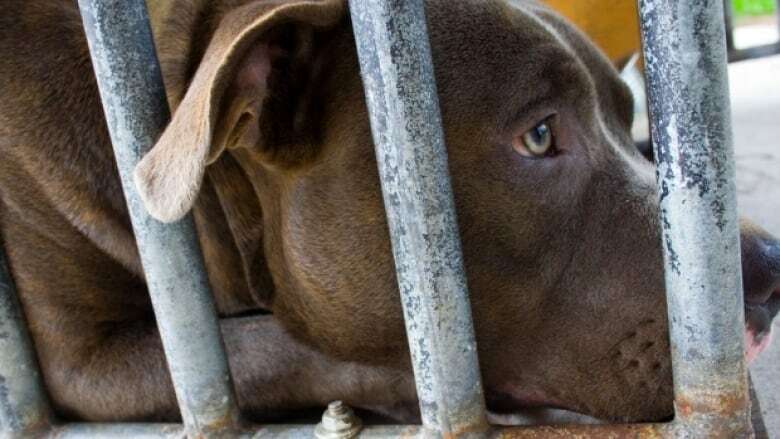 The dogs have each been individually assessed to determine what type of treatment they need, and are being held in a secure facility outside of the Chatham-Kent area. But, Dewar said, it is up to the courts now to decide what happens to them, since they are banned in Ontario. "In the interim, we will continue to provide the care they require and deserve," he said. This is the first Ontario SPCA dog-fighting investigation since 2006. Dewar said the reason isn't that dog-fighting isn't happening, but that it's so deep underground. "It is very underground," Dewar said. "It's usually tied with other aspects of crime and isn't commonly spoken about within communities." "It's happening, this is one example of it. In the province of Ontario there are likely other locations like this and this is why we need the community to come forward," he said. The investigation is ongoing and none of the charges against the accused have been proven in court.